3 ... 2 ... 1 ... Take off! Ask yourself on Mars, where the greatest adventure awaits you. 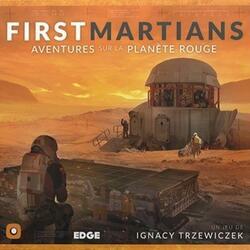 First Martians: Adventures on the Red Planet tells the extraordinary epic of a group of astronauts trying to survive in a hostile environment. Conduct independent missions or chain them to create epic campaigns! Make hard choices and take the consequences! Shiver and leap at every turn of events! Choose your level of difficulty and your game mode: who do you want to be, today? A scientist, an explorer or an engineer? First Martians enjoys exceptional replayability and, at each game, the story will evolve according to the decisions of your group of players. All this is possible thanks to the free auxiliary application, intended to enrich your parts. Its Artificial Intelligence will adjust the level of play according to your expectations, and will organize in a thrilling scenario and tell you in an immersive way the adventures that it will have chosen for your team among more than 500 events and adventures!